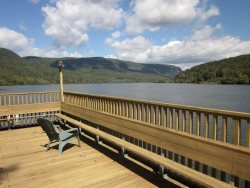 15% Off Weeknight Rates, Ravenwood Cabin. Sleeps 4. Pet Friendly! Log cabin located on private 100-acre wooded tract half way up Lookout Mountain. Deck accessible from living area and queen bedroom. Close to Lookout Mountain Hang Gliding, Cloudland Canyon State Park, Canyon Grill and Lookout Mountain Pizza Company. Close to Ravenwood Manor. Larger parties can rent both and receive 10% off the nightly rate. Internet can be slow or service can be interrupted. Bring your hot spot as a back up! This log cabin is fully equipped with a kitchen and all the necessary appliances. It also has a stacked washer/dryer, and a full bath (no outhouse needed at this log cabin). The comfortable living room includes a cast iron, wood burning stove and, for those who need it, a TV (sometimes 2 channels and sometimes 12 channels depending on the digital antenna reception) with a ROKU stick for movies and entertainment. Oh, and the internet is fair, so the ROKU may not work that well, that is all that is currently available - DSL. It is very unreliable and actually may not work. Entertainment DVD Player, Stereo System, Minimal Channels On Television, Access your Netflix on Roku When The Internet is Working. The Woods! Wedding weekend Great little cabin! Very clean and staff was easy to get a hold of when we had questions. Would stay again.